I’ve suggested that part of becoming a good rider is knowing something about maintenance. Battery care is one of those tasks for which you need to be responsible, even if you have all your servicing done by a dealer. If you’re like me, you want to ride your motorcycle, not be a slave to battery maintenance. But my Can Am Spyder had been experiencing some electrical issues. About a month after taking delivery, Sparky’s original battery suddenly died. I bought an "Odyssey" AGM sealed battery as a replacement. That got Sparky running again, and I made my usual summer trips. I normally plug my machines into automatic chargers when they aren’t being ridden. But I had a brain fart and forgot to plug Sparky into a charger. Six weeks later Sparky’s fancy Odyssey battery was flat. A quick trip to the dealer determined the charging system was fine. The battery was just severely discharged. And, BTW, Spyders have some parasitic loads that can discharge the battery rather quickly. The big eye-opener was that none of my automatic chargers would bring the discharged Odyssey back to life. The famous-brand chargers* just turned turtle and flashed the "battery problem" light. *you know, the ones with the yellow name that rhymes "fender," hyped as "charges all batteries." If you’re a battery guru, you can skip the rest of this. But if you’re a rider like me, perhaps you’re ready for a jolt of reality. First, for those who aren’t "gearheads," let’s do a little battery review. There are two basic types of lead/acid motorcycle batteries on the market, "flooded" and "sealed." And now there is a completely different type, lithium-iron-phosphate (LiFeP04). The old flooded lead acid battery (FLA) has lead plates suspended in liquid battery acid. They have a small vent tube plugged into the top chamber, to allow acid droplets to bypass any delicate motorcycle parts. One advantage of an FLA battery is that you can top up the electrolyte with distilled water, as needed. FLA batteries also have a slightly lower resting voltage, which means the charging system on an old bike will probably keep a FLA battery charged. Batteries today are mostly "sealed lead/acid" (SLA). Sealing the acid electrolyte inside the case is a huge advantage for reducing corrosion, and enabling safe shipping. You can even lay the bike on its side, without fear of battery acid dribbling out. The downside of an SLA is that there is no way to replace the electrolyte as it slowly evaporates. The most common type of SLA battery is Absorbed Glass Mat (AGM), in which the battery acid is entirely absorbed into dense fiberglass mats, so it can’t leak out. 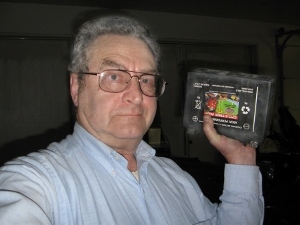 AGMs typically have a higher resting voltage than an FLA. Another type of sealed battery is "gel," where the battery acid is chemically treated to make it about the consistency of pudding. Now, I admit that I didn’t pay much attention when AGM and Gel batteries came out about 20 years ago. Dealers explained that AGMs and Gels needed special battery chargers. But, like most riders, I naively assumed that 12 volts is 12 volts, and the rest was just sales hype. My little experience with Sparky demonstrated that it’s a bit more complex than I had realized. First, even with the key turned off, a battery in a motorcycle will slowly discharge. Second, although we might call a battery "12-Volt," the actual voltage can be higher than that. When a battery is charged fully, there is a temporary surface charge, which might be around 13.5 or 13.7 Volts. Then, after charging, the voltage gradually comes down to a "resting" voltage, maybe 12.7 or 13.1 V.
Yeh, But Doesn’t the Bike Charge the Battery? Of course, the battery is recharged when the engine is running. And, after a ride, the battery will be at whatever voltage the bike’s voltage regulator has been supplying. But some motorcycles are notorious for overcharging, and others were originally designed back in the days of flooded batteries. So, if you install a new AGM or Lithium Iron battery in an old machine that was originally designed for FLA, the charging system could be working perfectly, but never get the new battery fully charged. If you run the bike every week or two you’ll keep the battery alive, but not necessarily fully charged. Contemporary machines regulate at a slightly higher voltage—more in line with SLA batteries. The problem comes when you let the bike sit for a month or two without running—as I did. Today’s machines have various "parasitic" loads, such as clocks and security systems that slowly draw down the battery even when the key is off. And the charging system diodes may "leak," allowing a small but steady discharge backwards into the alternator. The reality of my situation with Sparky was that none of my automatic chargers were capable of bringing a discharged AGM battery back to life. What I needed was a smarter and higher powered charger to desulfate the plates, and a charging sequence (algorithm) that would automatically get Sparky’s battery fully charged without me having to babysit the process. Today’s "smart" battery chargers do a lot more than charge. They read the type of battery, determine its state of charge and condition, and automatically adjust the voltage, current, and charging time it needs to bring it back to health. For a discharged battery, the complex charging algorithm first provides a constant (bulk) charge until voltage spikes at a cut-off point (which varies depending on the battery type). For an AGM, the cut-off voltage might be around 16.0V. For a gel, it's maybe 15.0V, and for an FLA, perhaps 14.0V. Then the voltage is reduced and the charge rate (amperage) is tapered off during what is called the "absorption stage," which may last 4 or 5 additional hours. The charger then applies a low amperage "float" charge at say, 13.5V. The Odyssey battery site recommended an ACI smart charger, and I got the model 1214CC with a capacity of 7.0 Amps. At the time I had other machines, so I obtained an 0.8A Optimate 4. With the new chargers in hand, I excitedly hooked them up and tested the voltages with a digital voltmeter, comparing the new chargers against the old ones in my garage. The fully automatic ACI 1214CC has an output of up to 7 amps, but only a single light to keep you entertained. That’s OK, it’s fully automatic. 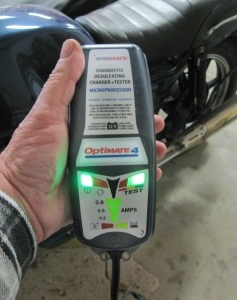 The Optimate 4 automatic charger has a number of complex algorithms to charge FLA and SLA batteries, at up to 0.8 Amps. For entertainment you can read the various lights to determine what it’s doing at the moment, as well as battery condition. 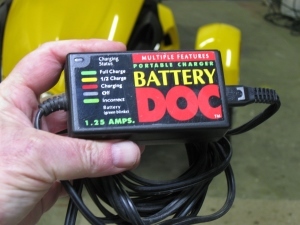 The 1.25A Battery Doc Portable is small enough to carry on a bike, has a detachable power cord, and has a column of lights to show more about what its doing. There’s also a sealed version that’s waterproof. At the time I had four motorcycles. My batteries included a Panasonic AGM, a Westco AGM, an Odyssey AGM, and a spare Interstate Cycletron Plus AGM. I connected each charger to each battery for a minimum of 12 hours, and measured the "float" voltage. Then I disconnected the chargers, allowed the batteries to rest for a minimum of 12 hours, and measured the "resting" voltages. I rotated the chargers over several days, with the garage maintained at 65F. In addition to the above, I tested two brand new "junior" chargers straight off the dealer’s shelf, and did some research to find the specifications for the different chargers. Let’s note that a charger must produce a float voltage that’s higher than the resting voltage of a battery. My old "famous brand" chargers were marginal for all the batteries, and couldn’t produce enough voltage for the Panasonic or Westco. My cheap chargers would probably have prevented any of the batteries from going flat, but would never have given them a full charge. The issue is that maintaining a battery at 60% or 70% of full charge will shorten the battery’s life. That’s why the manufacturer of a charger can truthfully state "charges all batteries." They don’t say their charger will keep all batteries charged to 100% of capacity in all climates, or that certain batteries must discharge a volt or two before the charger can kick in. All my "12 Volt" AGM batteries seemed to rest at right around 13V. The ACI 1214CC settled on float voltages averaging 0.77V above the typical "resting" voltage. The Optimate 4 floated an average of 0.56V above resting voltage. I was pleased that the Battery Doc smart chargers I’ve been using are in the ball park. I dumped the "famous brand" chargers in the trash, and gave the two junior versions to a friend who lives in a hot climate. A fully charged battery will survive freezing temperatures, but dies quickly in hot temperatures. The ideal charging and float voltages can be 2 volts different for cold vs. hot charging. We’re lucky here in the Northwest because our typical temperatures are mild enough for batteries to survive for many years. 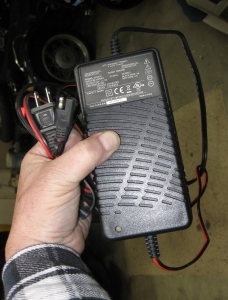 During the scorching summertime in Texas and Arizona my friends can use the cheap chargers producing lower float voltages that are less likely to overcharge their batteries, but in the wintertime the same chargers won’t keep their batteries up. Ideally, both battery chargers and bike voltage regulators would have temperature compensation, but that jacks up the costs. Most bikes have voltage regulators set for average temperatures, and in hot climates they will consistently overcharge batteries. When you’re buying a battery charger, temperature compensation is a valuable feature, and worth the additional expense. The ideal voltages are quite different for different temperatures. For a gel battery, the ideal charge voltages should be about 0.5V lower, but the float voltages would be the same as for an AGM. If you’ve been using a charger, but your starter always seems to crank slowly, or your batteries typically fail within three years, it could be the charger. I suggest taking a few voltage measurements with a reliable digital voltmeter to see how your charger measures up. In the Northwest, with the key off and the charger connected for 12 hours or so, a "flooded" battery should settle to a float of around 12.5V – 12.6V, indicating 90% to 100% of full charge. An AGM should settle down to a float between 12.9V and 14.5V, depending on temperature. 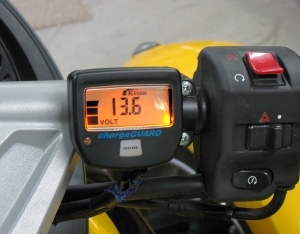 I installed a ChargeGuard voltmeter on Sparky to be able to read what was happening, and I really liked it. It was comforting to wander by Sparky in the garage with the charger connected, and see 13.6V on the meter. I really like having a digital voltmeter on the bars. This Kisan meter can also display amps and temperature. It turns off when the key is switched off, but turns on when a charger is connected. Lithium-Iron-Phosphate (aka LiFeP04 or Lithium-Ferro-Phosphate) batteries are new on the market. One major brand is Shorai. One big advantage of the LiFeP04 batteries is that they are much lighter--less than half the weight of an AGM. LiFeP04s can crank a starter at a very high rate without battery damage, in a wide temperature range. They have a long charge-discharge cycle life, and can accept fast charging. Theoretically they have a very slow self-discharge rate. That means a long shelf life at the dealer--but not zero discharge when installed in the bike. You’ll still want to keep a LiFeP04 on a smart charger. However, the different chemistry and charge/discharge characteristics of LiFeP04 batteries means they require a special "Lithium" charger. It’s not clear how a LiFeP04 will react when installed in an older bike, or in a machine with can bus electrics. It will be interesting to see what happens after more of them are installed in different motorcycles.